Scooters are not just for kids anymore, but for adults too. That is where electric scooters come in, which are starting to become a new popular transport trend – perfect for the commute to work and easy to navigate without taking up too much road space! Electric scooters can be great fun to ride, and easily get you from A to B in no time. This article will provide you with six of the best electric scooters for adults currently on the market. The Power core E90 electric scooter by Razor is one which packs some power! Razor prides themselves on providing the very best riding experience possible; therefore, with this electric scooter you are definitely guaranteed a good, enjoyable riding experience. Razor is all about innovation. Manufactured in Southern California, their scooters are built with the customer in mind, and created use cutting-edge technology together with high-quality materials, which ensure a product suited to evolving lifestyles. The power core E90 features a strong steel design, featuring innovative hub motor technology. 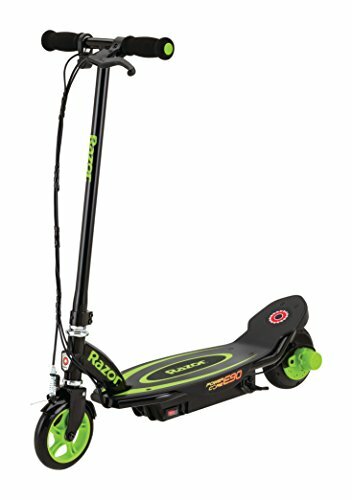 As mentioned, Razor’s scooters are made with cutting edge-technology, and their Power Core E90 represents this. It features a push button throttle on the handlebars, allowing the user to have complete control over their speed limit. Brakes as well as a limiter help to keep the rider safe, making sure to keep within the 10 mph road limit. This electric scooter is suited to those aged 8 and above, and can hold weights up to 120lbs. It is therefore a great electric scooter for families and can be enjoyed by everyone! If you are looking for a scooter that is comfortable and a joy to ride, then the Glider by Gotrax is a perfect choice for you. Just as the name suggests, this electric scooter glides up to 17 mph with its powerful 250w motor, making your journey an excitingly quick one. Here we will take you through some of the Glider’s features. The Gotrax electric scooter is one which was made to last. The slim, sleek and lightweight design makes everyone want to have a turn on it. The Glider also comes in a range of different colors, ranging from black, pulsar pink and Mars red. With a space theme, the Glider by Gotrax is a perfect scooter for kids over nine years old, and adults alike. This electric scooter features a foldable design, including a lever-activated folding system, meaning it can easily be packed up and stored at home – without taking up too much space. Thanks to its compact size, the Glider is the perfect scooter for use on the go, and to take out and about when travelling. The Glider is an ideal electric scooter for beginners, as it comes equipped with a hand-controlled break as well as a foot-activated system to slow down. This helps put minds at ease when riding at faster speeds. The Glider also features a nice LED headlight, making riding in the dark a possibility. One of the glider’s best features is its backlit display screen, which allows riders to check their battery life wherever they may be. They can also easily track their speed to make sure they are not over the limit, which is really helpful and useful for new electric bike riders. The Super Turbo Elite from Super Cycles & Scooters is a scooter which was built for comfort. Unlike many other traditional scooters, this one comes with a detachable seat! Therefore, you are certainly guaranteed a pleasant ride with this scooter. Featuring a 1000watt motor, it is an agile scooter producing speeds of up to 27mph. In production for over 10 years, the Super turbo Elite Electric scooter is one which provides a fast riding experience as well as a comfortable one! It is a very strong, powerful scooter which performs extremely well. The Super Turbo Elite has actually been upgraded from the previous model, with new improvements, which means this is the best version currently available from Super Cycles and Scooters. It comes in an eye-catching neon green color, and includes a lot of attractive features. The Super Turbo Elite is one of the best durable electric scooters currently on the market. Thanks to its design it can carry up to 250lbs while riding on flat ground, and up to 300lbs when riding uphill, with the extra hill kit add-on. The best improved feature of the Super turbo Elite is the added comfort seat. Sometimes when riding an electronic scooter, you can start to become tired. The change of a seat would be welcomed and with this scooter it is actually a possibility! The scooter also includes a small storage bag, making it easier to store any items while on your journey. Which is the Best Electric scooter for me? If you are looking for the best electric scooter for adults which is strong yet provides a smooth and comfortable riding experience at the same time, then the best bet is likely to be the Super Turbo Elite electric scooter by Super Cycles and Scooters. A very popular choice, this scooter is guaranteed to make your journey a much more fun and enjoyable one! If on the other hand you prefer an electric scooter which is simple and easy to use, then the Power Core E90 by Razor it a good option to go with, as it features an innovative cutting-edge design.